During times of difficulty, we can all benefit from a little extra help, and the beautiful energy generated by various crystals is perfect for that. 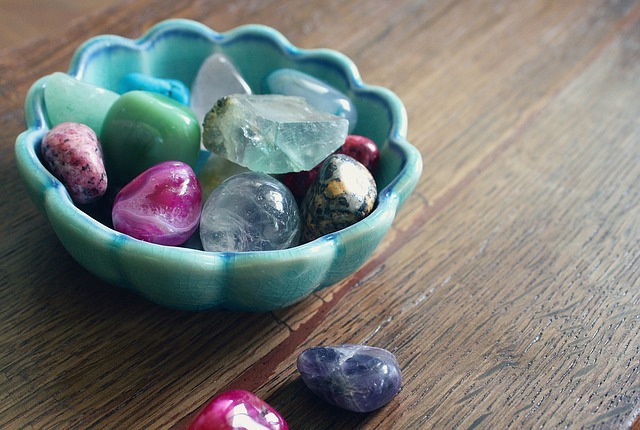 Whether you need a pick-me-up or something to calm or soothe frayed emotions, there are many stones you may want to consider working with. Tourmaline – Provides a psychic shield against harmful energies, entities, and destructive forces. Transforms negative thinking into positive. Snowflake Obsidian – Balances mind and body, while protecting against negativity. Promotes a sense of grounding and calm during times of change. Helps us see unconsciously hidden fears and harmful patterns. Smokey Quartz – Promotes present moment focus and good organization. Clears up miscommunication and opens paths of perception. Can assist in overcoming grief and despair, allow healing, reconciliation and renewed sense of joy. Citrine – Associated with success and abundance, it promotes mental clarity, personal power, confidence, self-worth and joy. Excellent for overcoming depression, fears and phobias, and preventing nightmares. Carnelian – Promotes ambition, courage and confidence. Assists with manifesting the life you want. Boosts energy and restores motivation. Enhances creativity and encourages positivity and joy. Orange Calcite – A highly energizing and cleansing stone. Soothes the emotions, removes fear and overcomes depression. Dissolves problems and clears out destructive patterns. Maximizes potential. Promotes feelings of joy and optimism. Rose Quartz – Opens the heart and increases self-acceptance and the ability to love others. Soothes heartache and brings peace, compassion and kindness. Relieves childhood trauma and guilt, and eases transitions. Attracts or rekindles love. Rhodochrosite – Represents selfless love and compassion. Assists the heart with emotional healing and encourages the release of pain. Promotes a positive attitude. Used during meditation to reach states of joy. Chrysocolla – Facilitates communication. Eases blockages of the heart (fear, loss, guilt, anger and sorrow). Strengthens emotional connections, encouraging forgiveness and compassion. Increases inner strength and tolerance. Lepidolite – Promotes trust, calm and acceptance, along with relaxation and balance. Facilitates ease and optimism during transitions. Brings hope in dark times and encourages self-love. Anti-nightmare. Amethyst – Known for its healing powers, it also has the ability to attract spiritual energies and calm restless thoughts. Provides peace of mind, which is good for meditation and promoting serene dreams. Fluorite – Cleanses the auric field, removes negativity and provides psychic protection. Calms anxiety, eases anger and promotes balance. Abalone Shell – Stimulates imagination. Calms emotions and redirects one toward feelings of love, compassion and beauty. Soothes anxiety and stress. Promotes harmony, balance and peace. Garnet – Re-energizes and stabilizes. Works with the root chakra to manifest dreams. Promotes courage and self-confidence. Enhances sexuality and passion. Sunstone – Encourages optimism and turns negative energies into positive. Brings luck and abundance. Removes fears and phobias. Promotes leadership abilities. Enhances self-discipline, strength and vitality.